In 2017, US research institute SRI International unveiled its Taurus robot, a bomb disposal robot that allowed operators to control it using a virtual reality headset. 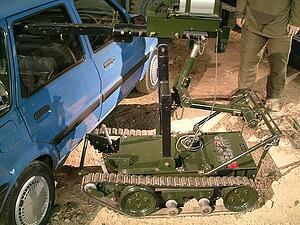 This is just the latest in a long line of technology developments for bomb disposal units. Here, military robot battery manufacturer Ultralife Corporation, explains the power considerations of advanced bomb disposal robots. When they were first conceived in 1972, bomb disposal, or Explosive Ordnance Disposal (EOD), robots were a far cry from the feats of engineering that are in use today. In fact, the first unit was known as the wheelbarrow because that’s effectively what it was, an electric wheelbarrow with a claw to safely move car bombs. The wheelbarrow robot is still a hallmark of domestic EOD units to this day but, while popular, even its modern iterations are viewed as clunky and aged. 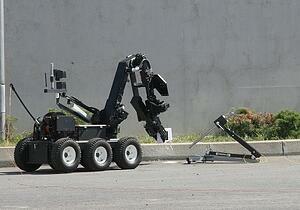 This has led to several defense organisations around the world investing in newer unmanned EOD systems. For example, the UK’s Ministry of Defence (MoD) invested £55m in Harris Robotics’ T7 bomb disposal robots in 2017, which it states can disarm bombs 20% faster than previous models. Meanwhile, the US Department of Defense (DoD) awarded a $429m contract for unmanned ground robots with EOD capabilities earlier in 2018. Defense contractors consider many things when specifying EOD units, from the way the operator controls the system to the tools that the unit is fitted with. But whether the EOD robot is VR operated or remote controlled, or fitted with manipulator arms or water disruptors, each unit will have different power requirements. Design engineers must ensure these requirements are reliably met by incorporating batteries for EOD robots into the design process as soon as possible. Without due consideration of the battery, there is a greater risk of a unit failing during use. 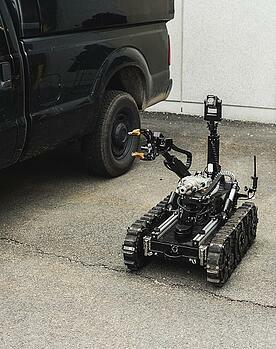 For example, a bomb disposal robot fitted with a water disruptor will draw higher voltage from the battery for short periods while the disruptor is being used. If a battery is not suited to reliably operate under these conditions, it isn’t a good fit for that unit, even though it could be serviceable for EOD robots with claws. The best way to ensure a battery is the right fit for a specific EOD unit is to consult with a bomb disposal Robotics battery manufacturer. Ultralife Corporation, for example, has decades of experience in the military and defense industry, so the company’s battery specialists understand the operating requirements of EOD robots. In addition, Ultralife’s military batteries are certified to MIL-PRF-32383/3(CR) standards, guaranteeing quality and preventing delays in getting systems to market. This is particularly important when we consider the current eagerness from defense departments to invest in better, more effective EOD robots. Whether your bomb disposal robot is compatible with VR headsets to provide a better view of the process or just fitted with multiple tools, ensuring the power supply is fit for purpose is the cornerstone of success.